Tradition, territory and a modern style. We chose to work only with native grape varieties and the purity of our land. Over the years, we have worked to unite our native grape varieties with the unique qualities of our soils. Each variety is vinified separately in stainless steel in order to preserve the best qualities of each one. You will always find the purity of our land and the grape varieties in our wines. We practice precision viticulture, respecting the environment, thanks to our careful vineyard and winery management and cutting-edge technologies. Treatments are kept to a bare minimum. We have come up with a well-thought-out viticulture philosophy meant to respect the local area’s natural qualities and the typicity of the grape varieties native to Romagna. From our wines, we seek purity, polish and precision. We only bottle the best years as per our quality standards. 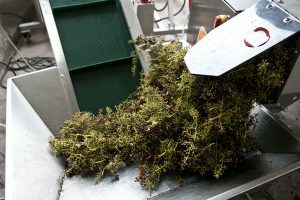 After the grapes are gently loaded onto the vibrating table, a second sorting takes place (the first phase in selecting the best bunches of grapes is carried out in the vineyard by specialized personnel). The vibration eliminates even more pieces that are not up to the company’s quality standards. Another view of the process. The small carts and vibrating table. Rejected grapes and waste from this step. 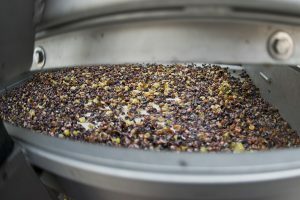 Notice how much is rejected during this process; it is material that otherwise would be vinified. 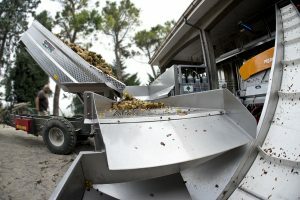 The best grapes go through a machine that removes the grapes from their stems, with one more selection, ensuring only the best grapes are kept, and the worst ones are eliminated. Notice the constant use of nitrogen. 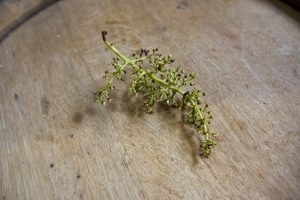 A closer look at how individual grapes are selected. 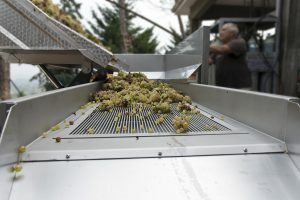 Healthy grapes are moved over to the bladder press. What is left after this procedure. Note the stems are left whole. What is left of a bunch that goes through this procedure. Notice how the pedicels are still attached to the stem. Stainless steel tanks used for the vinification process. 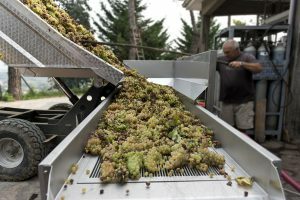 The grapes are all gathered by hand and put in small uniquely shaped steel carts that can reach the harvest center in just a few minutes. 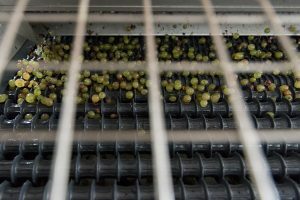 The following steps are dedicated to selecting each grape to make sure only the best ones are used for vinification. 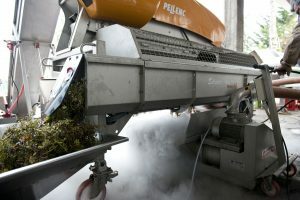 All of the phases of processing the grapes take place with nitrogen in order to avoid any possible deterioration. This helps preserve all production phases and means that the fruit remains whole, perfectly maintaining its unique qualities. 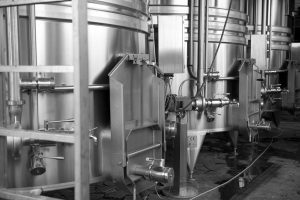 The next steps in processing the must and wine are carried out in temperature-controlled stainless steel tanks. 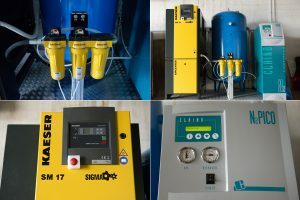 During the entire process, which starts in the vineyard for us, the grapes, the must and the future wine are all continuously inspected and analyzed by specialized laboratories in order to guarantee constant quality. These analyses are constantly done before the wine is bottled. Further analyses take place after it is bottled, with the sole objective being to check the progress of the wine and guarantee a product that is in perfect condition for the consumer. In addition to the laboratory analyses mentioned above, during each processing phase, all of our wines – from when they are in the tanks to when they are bottled – undergo rigorous weekly tastings. They are done by experts so we can guarantee the sensorial qualities of the product the consumer will eventually drink. Hopper for receiving grapes and vacuum press with inertization system.